Moss does not cling to a rolling stone. Joe Hill sent this note to his friend Elizabeth Gurley Flynn. Yellowed with age, this small slip of paper captures a moment in history. Swedish-born Hill, perhaps the most famous troubadour of the early American labor movement, was a member of the Industrial Workers of the World (IWW) who was arrested on trumped-up charges and executed in 1915 in Salt Lake City. The telegram was his last will and testament and is just one small part of the massive gift by the Communist Party USA to the Tamiment Library at New York University earlier this year. The donated materials include the entire collection of the Reference Center for Marxist Studies, the archives of the CPUSA and the photo morgue of the party’s press. Flynn was a popular heroine of the labor movement, a founder of the American Civil Liberties Union and a campaigner for the freedom of anarchist political prisoners Sacco and Vanzetti. Famed for her eloquent and fiery speeches, Flynn was the subject of Hill’s song “Rebel Girl.” She went on to join the Communist Party and became its national chair after serving time in prison under a Smith Act conviction. The note from Hill to Flynn was part of her personal papers kept in the CPUSA archives, managed by the party’s History Commission chair Mary Licht and others, after Flynn’s death in 1964. The Communist Party was the most influential organization on the American left during the 20th century. It made indelible contributions to the movements for peace, justice, equality and working people’s rights. The countless leaflets, photos, films, tapes, record albums, letters and books in the collection catalog the tireless work of tens of thousands of Communists and millions more influenced by and supporting them. The Tamiment Library is one of the preeminent research institutions on U.S. labor and radical movements. Since 1977, it has housed the Robert F. Wagner Archives, which holds the histories of the New York City Central Labor Council and its 200 member unions. It also contains the Abraham Lincoln Brigade Archives. Even before the recent CPUSA gift, Tamiment housed many collections that document Communist Party history. The personal papers of such Communist Party leaders as Betty Gannett, Simon Gerson, James E. Jackson, New York City Councilman Peter V. Cacchione and artist Hugo Gellert were already stored in the library. It recently acquired the papers of B. D. Amis, an influential but little-known African American labor and civil rights leader and communist. A researcher looking to publish Amis’ speeches and writings contacted Bell. When he saw the delicate condition of the collection, he recommended the family talk to Tamiment. “[Tamiment Director] Michael Nash said, ‘I am coming down right away to look at these things,’” said Bell. 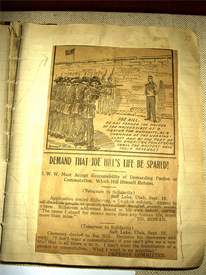 Amis’ collection includes documents on the campaign to free the Scottsboro Nine and rare documentation off the U.S. campaign against Mussolini’s invasion of Ethiopia in 1935. Many other African American leaders are immortalized in Tamiment’s stacks. Oral histories include interviews with W.E.B. Du Bois, the preeminent Black leader of the first half of the 20th century, who joined the Communist Party in 1961. One tape has Du Bois commenting favorably on the dramatic student protests at lunch counters and on buses in the late 1950s. There is also correspondence between party leaders and the great actor, singer and activist Paul Robeson. African Americans in the Communist Party were also intimately involved with the organization of Blacks into the labor movement and the building of racially integrated trade unions in the Congress of Industrial Organizations. There is extensive coverage of the campaign to free Angela Davis. Tamiment also holds the archives of many organizations that communists helped found or lead including the radical children’s retreat Camp Wo-Chi-Ca; the pioneering immigrant rights organization the American Committee for Protection of the Foreign Born; New York City’s Marxist academy, the Jefferson School; the health care and insurance association the International Workers Order; and the National Council of American-Soviet Friendship, to name a few. With the CPUSA’s recent gift, Tamiment became the preeminent archive of U.S. Communist history. No other research institution has such a collection with official documents, papers from individual notables, mass organizations and even a microfilm copy of the CPUSA’s archives from Moscow that were acquired by the Library of Congress. For many years, Lottie Gordon was the director of the Reference Center for Marxist Studies and the custodian of its many treasures. She and the dedicated staff, volunteers and board members such as Philip Bonosky and Charles Keller made the collection available to researchers, filmmakers and activists. Warren Beatty looked to the Reference Center for background research on John Reed and the early years of the Communist Party for his famous film, “Reds.” Gordon passed away soon after the Reference Center’s 20th anniversary in 2000, leaving behind a unique collection — including more than 25,000 books — that constitutes the bulk of the gift to Tamiment. In the summer of 2006, Tamiment librarians and interns carefully reboxed the papers, audiotapes, photos and books for shipment. They moved the collection quickly in order to clear the two floors it occupied, which were slated for renovation as part of a project to modernize and improve the Manhattan building and offices of the CPUSA. The scope of the collection is daunting. There are 10,000-plus pamphlets, hundreds of audiotapes and rare films, and 2,000 boxes of papers. While no one will know the actual figure until the collection is cataloged, library staff estimate that there are more than 500,000 photographs in the collection from the Communist press documenting strikes, electoral work and other struggles of the past 80 years. The collection contains the only complete surviving print of “The Passaic Textile Strike” (1926) produced by International Workers Aid, a landmark of grassroots filmmaking. The Library of Congress is restoring the film for its collection — in exchange making a copy of the restored film available for Tamiment. The Communist press is a major part of the collection. In addition to the Daily Worker, the Daily World, the People’s Daily World and the People’s Weekly World, there are comprehensive collections of the Young Communist, the Challenge, Dynamic magazine and other publications of the Young Communist League and its predecessors. There are copies of the Morning Freiheit (the daily Yiddish-language newspaper), Rodo Shimbun (the Japanese-language publication) and more. There are leaflets, pamphlets and shop-floor newsletters in Russian, Finnish, Italian and almost every other language spoken by U.S. workers over the years. The Spanish-language books and papers extensively document the liberation struggles in Latin America, as well as of Latinos in the U.S. The collection contains information on Jesus Colón, pioneering Puerto Rican writer, as well Mexican American Communists, not to mention Cuban patriot José Martí. It also includes the Spanish-language newspapers Nuestro Mundo and Voz del Pueblo. Among the hidden jewels in the collection is a stunning black-and-white photo portrait of a heavyset well-dressed man with a soft smile. It is a photo print of the famous Mexican muralist Diego Rivera, photographed by Tina Modotti. Modotti is renowned for her groundbreaking photography and artistic and personal relationship with American photographer Edward Weston. This rare photo is just one of many that might be lurking in the 2,000 boxes collected by Tamiment’s staff. The Communist Party collection is a record of a century of American radicalism. The Communist Party’s founding members came from the Socialist Party, the Socialist Labor Party, the Industrial Workers of the World and any number of local and regional unions and people’s organizations. The collection reflects and documents these movements, as well, with minutes from labor federation meetings, letters between notable radicals and leaflets from socialist organizations large and small. The collection has the rare and age-worn originals of the first documents issued by the Communist Party. The yellowed charter application shows the effort to build the party’s membership in the weeks following the founding of the Communist Party of America (CPA), on Sept. 2, 1919. Its very first bulletin, dated Sept. 18, 1919, declares the Communist Party “a fact” and calls for all socialist-minded workers to join forces. The CPUSA history is not limited to the 1920s. Nash said the majority of the collection relates to the post-World War II CPUSA. The records of party activities during the civil rights movement, the movement against the U.S. war in Vietnam, the anti-apartheid struggle and the fight against Reaganism belie the notion that the Communist Party disappeared in the 1950s. Libero Della Piana (ldellapiana @ cpusa.org) is chair of the NY district of the CPUSA and assisted in collecting the materials to move to Tamiment. Special thanks to the staff of Tamiment Library for assistance with the article and images.